The wood week goes on and I have decided to title this Total Look ‘Metropolitan nymph’, inspired by Serena’s make up suggestion and my outfit choice. For this make up she used colors of the leaves and forest, to remind the topic of this week (wood). After the jump, the make up guide to look like Serena and my fashion choice. 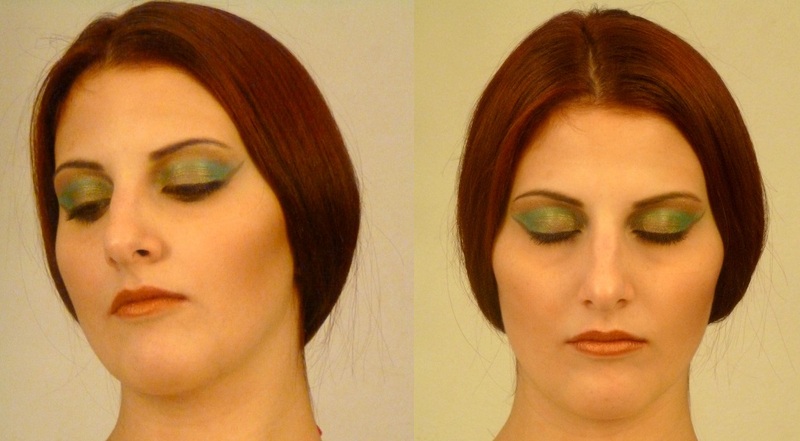 Eyes: as you can see in the following pictures, apply an emerald green eye shadow in the upper area of the eyelid. Then, in the mobile eyelid that it’s not making up, apply a pearly khaki green eye shadow and a pearly light brown eye shadow in the fixed eyelid. Then, use brown eyeliner to draw a thin line that begins at the first inner half of the eye and ends at the end of it (as you can see below). Apply a brown pencil and a khaki green mat pencil under the eyelid,which starts in the first half of the eye and ends the following points created with the bright green powder. Trace your eyebrows and, finally, use brown mascara in the upper lashes. Cheeks: apply bronzing powder under the cheekbone. Lips: use a pearly raw sienna lipstick and a pencil of the same color.